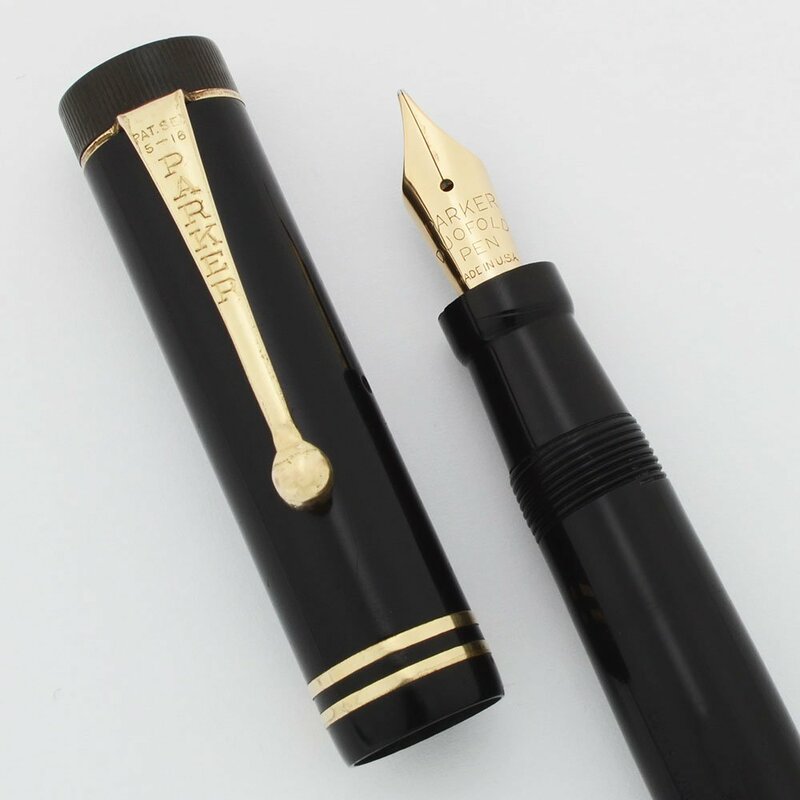 Parker late 1920s or 1930s Duofold Junior fountain pen. The nib is medium and is in excellent condition. Black with gold filled trim, two rings on cap band. Restored and in excellent working condition. Type Vintage fountain pen in excellent working condition. Product Name Parker Duofold Junior. Manufacturer and Year Parker, USA -- 1930s, based off of barrel imprint. Filling System Button filler. Excellent restored filling system, the work was done here at Peyton Street Pens. Color Black body and cap with gold filled trim. The cap has two narrow cap bands . Nib Medium Parker Duofold nib. It writes smoothly and is a little springy. It writes like a narrow medium. Condition Excellent condition. The pen has no cracks, bite marks, or personalization. The barrel imprint is clear. There are a few areas in the cap with marks. The cap bands and clip tassie have a few small dings. The plating has held up well with a good looking ball end of the clip. The body has some microscratching. The section collar has two sloping scratches, probably tool marks. The pen is working well.